*ANYTIME IS THE BEST TIME TO LISTEN TO YOUR SWEET BABY'S SOUNDS! * Enjoy the BEST, EASIEST AND SAFEST way to listen at home by using the BabyWhisper baby monitor. Included is a user friendly easy-to-understand instruction manual. Simply switch on your device, follow a couple easy steps, relax and enjoy music to mommy's ears and peace of mind hearing your baby's sounds. Unconditional money back guarantee. CRYSTAL-CLEAR EASY TO HEAR AUDIO WITH EASY ON/OFF SWITCH AND VOLUME CONTROL- BabyWhisper baby monitor is equipped with the latest audio producing technology with vibrant back-lit LCD screen and digital display, amplifying sounds in real time. EARLY BONDING WITH YOUR BABY- Listen to the most beautiful sound in the world, baby sounds! 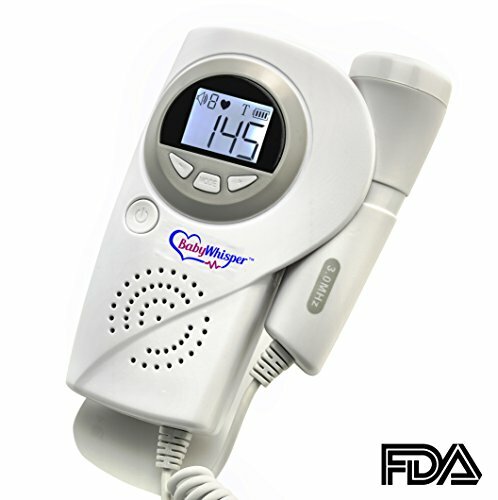 BabyWhisper monitor employs the latest in-home use technology to hear the adorable sounds and movements that a baby makes providing an unsurpassed Mommy and family bonding experience. LISTEN, SHARE, AND RECORD YOUR BABY'S SOUNDS- With a high-quality built in speaker this monitor allows Mom to safely listen and share baby movements, hiccups and other sounds with partner and loved ones. Or connect ear buds or headphones to standard 3.5mm audio jack to listen in private. The high quality speaker system makes it easy and fun to record your baby's sounds using any modern smart phone device recording feature. PERFECT GIFT IDEA- This monitor makes the ideal gift for any expecting mother and a must have gift for any baby shower. 100% UNCONDITIONAL MONEY BACK GUARANTEE- We are confident that you will love this premium BabyWhisper baby monitor that your purchase is backed by a full satisfaction guarantee. If you find any issues with our product, simply ship it back to us for a replacement or full refund. If you have any questions about this product by BabyWhisper, contact us by completing and submitting the form below. If you are looking for a specif part number, please include it with your message.